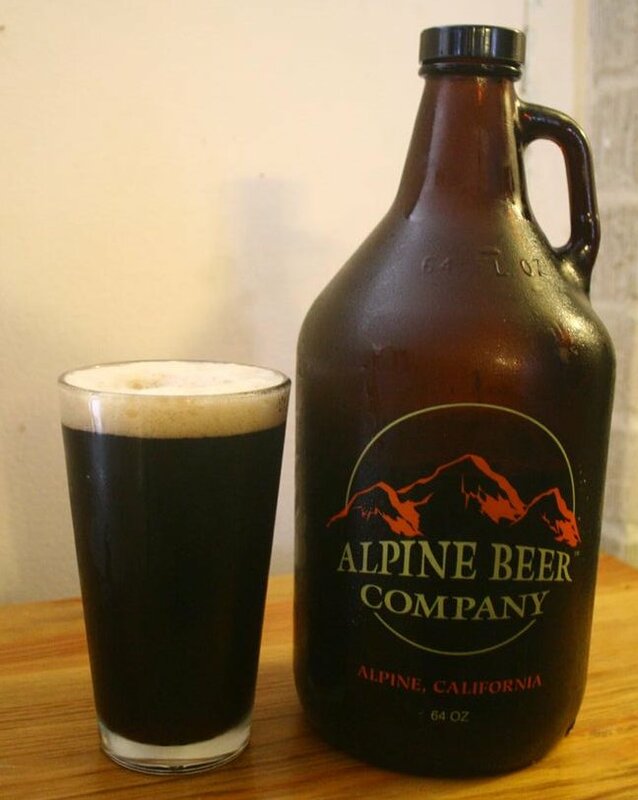 This past Labor Day weekend I took a trip up to Alpine, CA and brought back with me (among other things) a growler of Ugly, Alpine Beer Company’s Black IPA American-Style Black Ale. 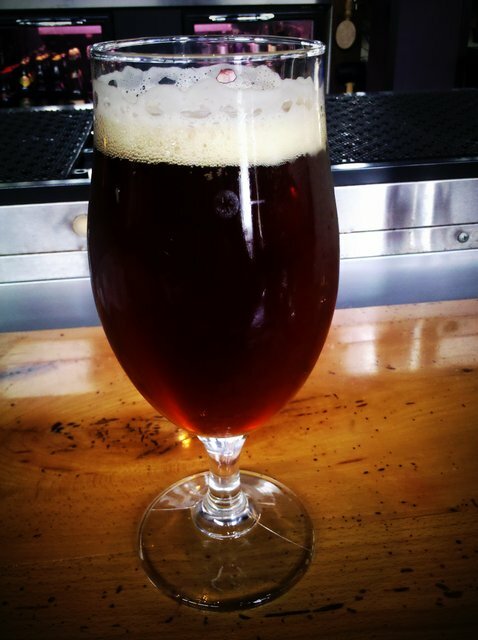 The name of the style has caused plenty of controversy among craft beer drinkers. Some find ‘Black IPA’ to be the best descriptor, it’s an IPA that’s dark in color. Others see an inherant contraction in that name Black India Pale Ale just doesn’t work for some people. Some in the Pacific Northwest want the style called Cascadian Dark Ale, which Stone Brewing Co. poked fun at with their recent Escondidian Imperial Black IPA. But earlier this year the Brewer’s Association stepped in and officially named the style ‘American-Style Black Ale‘ (whether this put the name controversy to rest is a different matter). In general I’m not a huge fan of this style. I don’t dislike it but if I’m going to drink an IPA I generally go for the good old fashioned pale colored kind. But when I was up at Alpine this past weekend I decided to fill up with Ugly ($12.99 plus $10 for a grolwer if you don’t already have one). Ugly is black with a bit of mocha head. From looks alone this could be a porter or stout, but upon first sniff it’s obvious that it’s not. Pine and grapefruit like hops take front and center with just a little bit of roasty chocolate like smells coming through. The taste is very much the same, just a hint of roast in the form of chocolate and coffee, but the grapefruit and pine flavors from the hops dominate and leave a long bitter finish after each sip. As the beer warms and sits in the glass a bit more of the roasty malts come through, but don’t be fooled, this is first and foremost an IPA. Ugly is only available on draft, which means if you want to enjoy it at home you’ll have to make the trek out to Alpine (which isn’t too bad of a drive, about half an hour from North Park without traffic- avoid the 4-6pm rush hour on weekdays). Toronado and O’Brien’s Pub often have some Alpine beers on draft. And even though you can’t get Ugly in a bottle, some of their other beers often show up at area shops and usually sell out pretty quickly. This past weekend when I stopped into Bottlecraft they had a few bottles of Duet in the cooler. Viktor at Sentence Beer (one of my favorite beer blogs) published an interview with Alpine’s Pat McIlhenney just last week. Again they don’t discuss Ugly directly but there’s plenty there about their other beers and the brewery itself. UPDATE: 6/22/2011: Word is that this project is no longer happening. Nickel’s announced at the National Homebrewers Conference that he is now focused on opening a BBQ-centric brewpub in Julian, CA with Vince Marsaglia of Pizza Port. These days a new beer bar opening up isn’t exactly newsworthy. It seems like craft beer focused bars are opening up all over the county at a good rate. It’s nice to see areas outside of the central San Diego – South Park/North Park/University Heights/Normal Heights getting better beer selections which is happening more and more. I try not to blog about every new place opening up, but this one caught my eye. 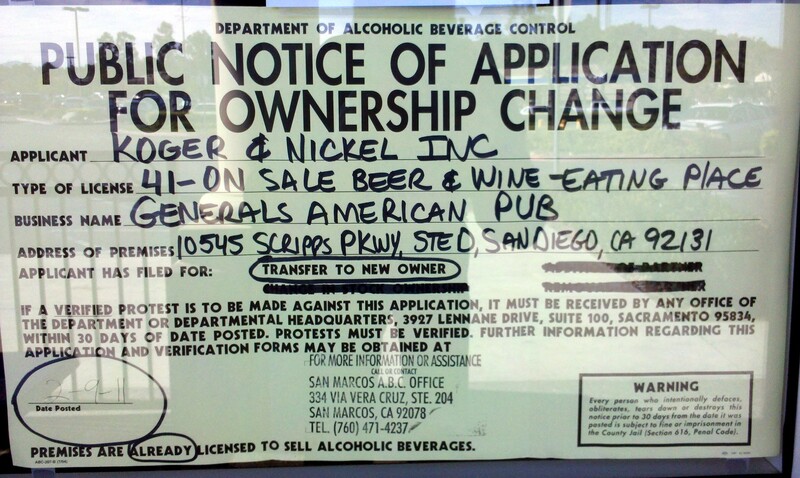 General’s American Pub is looking to open by June 1st in a shopping center in Scripps Ranch, just off Scripps Poway Parkway not too far from the 15. The previous tenant of the space was a restaurant called Santorini Island Grill. What stood out about General’s American Pub was the fact that Tom Nickel is involved. Nickel is a former brewer for Pizza Port Solana Beach, but these days he’s known as the owner of O’Brien’s Pub, one of the best beer bars around. I don’t know many details about what’s in store for General’s American Pub, but Nickel had this to say about it in a recent O’Brien’s newsletter: “Lindsey and I are helping our friend Larry open a pub in Scripp’s Ranch that should be operating by June 1st. Larry will be the owner and his pub will be called General’s American Pub and it will feature great beer and food just like O’Brien’s. Coral will be working up there full time when the pub opens, so soon you will be able to see her more regularly behind a bar.” Nickel is listed as an officer of the company applying for the liquor license for General’s American Pub, so it sounds like he’s formally involved with the new bar in some way. If General’s American Pub is even just half as great as O’Brien’s Pub is it will be a great thing for the people living nearby. June is still a few months off, so if I hear anything else newsworthy about General’s American Pub I’ll post it. And I’ll be sure to post an update once they open and I get to check it out. UPDATE 3/1/2011: I stopped by the location where General’s American Pub will be opening and took a picture of the posted ABC sign. It looks like Santorini is still operating in the space (they were closed when I went by but it looked like they were opening a bit later in the day). A sign posted in the window said they were planning on moving into a currently empty storefront next door and General’s American Pub would move into their current location, but it did note that the deal has not been finalized.